Everyone sees something different in a patch of bush. I usually wonder: were these patterns that we see created by natural forces (such as soils and geology) or by a hidden mosaic of past disturbances? Most times, I work in ecosystems with a long history of human disturbances, such as clearing and felling, grazing and burning. Their imprints can be both indelible and invisible, but more often, just plain forgotten. Yet we need to know how disturbances have altered natural ecosystems, so we can predict how our activities will alter ecosystems in the future. The best way to see the imprint of past disturbances is by combining field evidence and archival documents, like old reports and maps. But we often have to rely solely on field skills. Just as the science of geology required the law of superposition – which simply states that sediments were laid down sequentially, so lower strata are older than upper strata – so historical ecology requires the ability to see key juxtapositions. By observing how things are arranged in space, we can develop a chronology of past events and an informed narrative of ecological change. See this old tree, with its thick, low limbs? For most of its life it had few close neighbours. Otherwise the lower limbs would have been shed long ago. When it was an old tree, a big fire passed through – see the old scar on its trunk? The tree’s a lot bigger now and the scar is almost hidden. A long time later, a new cohort of trees established, look at them all. None of these small trees have scars, or any thick lower limbs. They must have come up before the drought – lots have died on the shallow soils by the rocks. But look over here, new seedlings are poking up through the grass. But it’s a different species this time around! The forest is changing yet again. 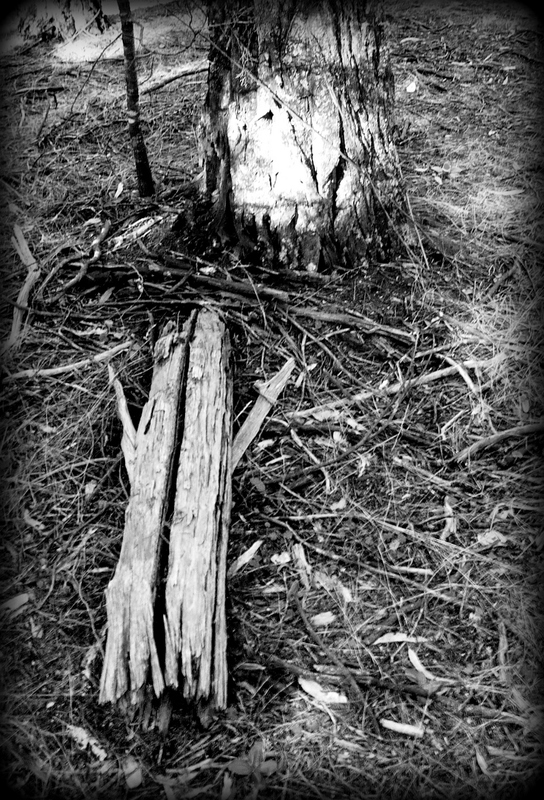 That’s quite a story to tell from a patch of dead, live and scarred old trees. Good field skills have a long legacy in natural history and ecology. Aldo Leopold began his famous book, A Sand County Almanac, with a great essay on American history, told through the growth rings of a dead oak tree. In Australia’s variable climate, tree rings are hard to date accurately, as plants grow erratically (whenever they can), rather than to a regular spring calendar. Like the growth rings, field observations can show us sequences of events, but the events float in time, and need to be anchored by solid dates. So we often turn to cultural documents, such as old newspapers, forestry records, archival plans and maps. Cultural relics in the field also anchor our histories. We once used old stumps from trees that were felled over a century ago to reconstruct what Callitris forests in central NSW looked like when Europeans first saw them. The stumps showed us how the number, size and arrangement of trees had changed over a 100-year period. Peter Spooner and I recently used marked blazes on old woodland eucalypts, made by surveyors in the 1800s, to develop a method to distinguish trees that came up before and after European settlement. American ecologists call these blazed trees, witness trees – a fitting name given the magnitude of the ecological and social changes they behold. Cultural relics often provide jarring reminders that, a century ago, the bush provided a home and livelihood for many more people than now. Recently I explored a back corner of Mt Pilot National Park. After pushing through thick forest, I discovered a fence post. It took me aback. Who’d plant a post in a dense forest on a steep rocky hill? I explored more, and found another, and another, in a ragged line heading dead north. This juxtaposition of posts and trees was illuminating. We know a lot about when the native tree, White Cypress-pine (Callitris glaucophylla) regenerated in south-east Australia. Seedlings emerged densely in the late 1800s, and then none came up until the 1950s, as rabbits ate all of the new growth. Black Cypress-pine (Callitris endlicheri) dominates at Mt Pilot. It’s not as well studied as White Cypress-pine, but has a similar ecology, and rabbits would have loved the sandy, granite soils at Mt Pilot. 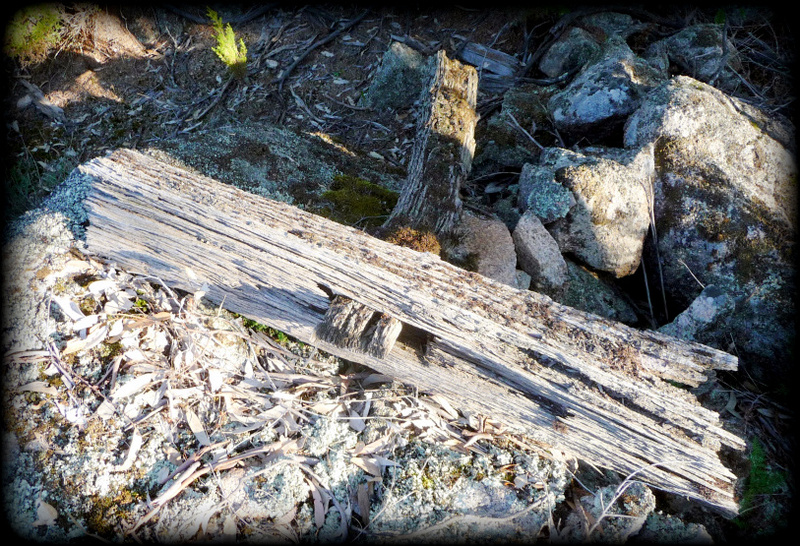 One old post lay at the base of a large Black Cypress-pine. By its size, I’d have guessed that the tree established in the mid-1800s, before the late-1800s regeneration pulse. But the fence said no. The fence was once strung with wire, and wire fences only became widespread after the 1850s. So tree and fence must both have established after the 1850s and – if Black Cypress-pine regenerated like White Cypress-pine did elsewhere – before the 1890s. 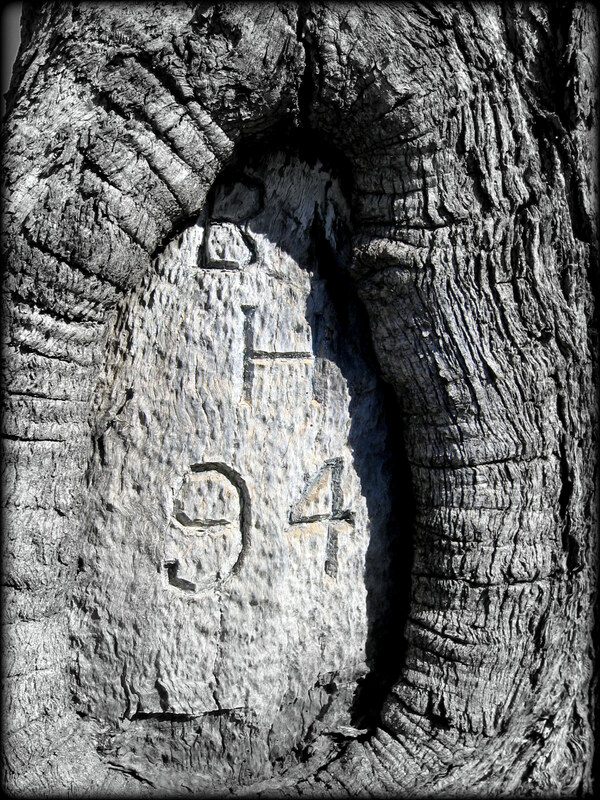 This juxtaposition of post and tree helped me to estimate the ages of other Callitris in the surrounding forest. A useful tip from a single, fallen post. More poignantly, the juxtaposition suggests that, within a few decades of the fence being built, the bush reclaimed the fence-line. Later on, the property reverted to the crown, as part of a state forest, and more recently, a national park. Sometimes cultural relics hold a fascination all their own. 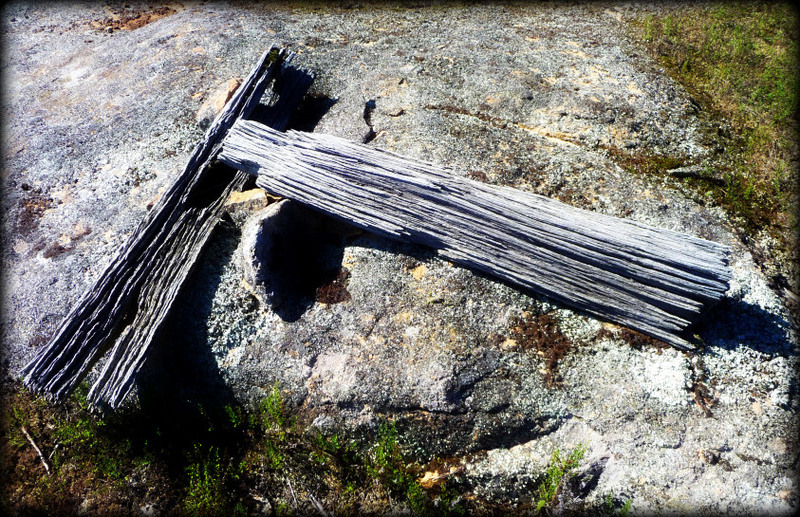 Further upslope, I found a series of paired posts that looked like post-and-rail fences, but with short, thick ‘rails’. I couldn’t make head or tail of them in the field, but John Pickard’s incomparable, Illustrated Glossary of Australian Rural Fence Terms cleared the air. Each pair contained a basal board (or ‘sill’) that supported an upright post. 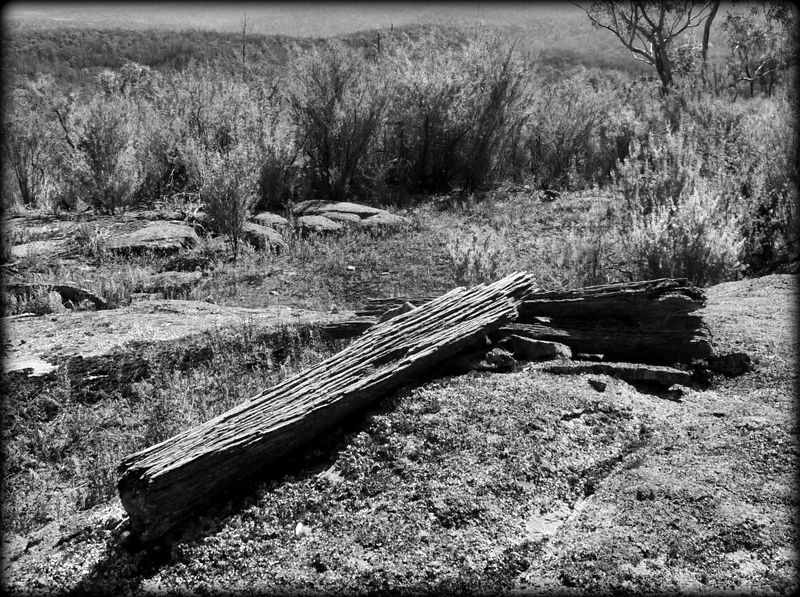 The sills were held down by rocks, which held the posts erect across rocky outcrops, where post holes couldn’t be dug. Admiring the view from the outcrop, I couldn’t help but be amazed at the work of the forgotten fencer. Building a fence straight up a steep slope, across wide granite outcrops, without deviating an inch from magnetic north. What vision did he have for his property? And what, eventually, caused this vision to waver? Years later, Callitris regrew over the hand-built fence. Was the property abandoned before the forest regenerated, or the other way around? Like all great inquiries, this juxtaposition of fence and tree, of history and nature, opens up many fascinating questions. It’s these juxtapositions of expectations and surprises that makes ‘reading the bush’ – and, more formally, documenting historical changes in natural ecosystems – such a great pastime (and a cool job). Every patch of bush has a richer history than we imagine. This story was first posted on Anzac Day 2011, back when hardly anyone had found my blog. I’ve improved the photos this time, but the text is unaltered. I hope you enjoyed reading it (perhaps again). Leopold, A. (1949). A Sand County Almanac and Sketches Here and There. Oxford University Press, Oxford. If you don’t know about Aldo Leopold, you should. The Aldo Leopold Foundation has loads of information about his life and work. Lunt, I.D., Jones, N., Spooner, P.G. & Petrow, M. (2006). Effects of European colonization on indigenous ecosystems: post-settlement changes in tree stand structures in Eucalyptus–Callitris woodlands in central New South Wales, Australia. Journal of Biogeography 33, 1102–1115. Spooner, P.G., Lunt, I.D. & Smallbone, L. (2010) Using growth-form attributes to identify pre-settlement woodland trees in central NSW, Australia. Australian Journal of Botany 58, 188-197.